Israeli soldiers invaded Thursday, Beit Ta’mar Palestinian village, east of the West Bank city of Bethlehem, and started firing live rounds at students, teachers and officials of the Ministry of Education, during a school celebration. 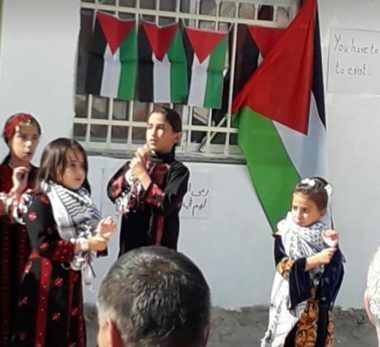 Media sources said the soldiers, and many illegal colonialist settlers, surrounded the area, before the army attacked the children, staffers and families, who were celebrating, singing and performing Dabka, in the Tahadi Basic School in the village. The very presence of the soldiers and the settlers caused fear in many children, who started crying before the soldiers fired many gas bombs and concussion grenades at the school, resulting in injuries, while many children suffered anxiety attacks. Palestinian Education Minister Sabri Saidam denounced the serious Israeli violations and attacks against the children. The head of the Bethlehem branch of the Minister of Education, Sami Marwa, said education ministry officials, and representatives of the UNESCO in Palestine, were visiting the school, before the soldiers opened fire. He added that many soldiers and illegal colonialist settlers also gathered near the main gate of al-Khansa’ School for Girls, in Teqoua town east of Bethlehem, while a UNESCO delegation was visiting it.